A tax on tobacco in the Philippines funded a huge increase in the number of families enrolled in a health insurance scheme. The global health context has changed dramatically. Countries spend more on health, as the population is ageing and the burden of chronic diseases is growing; novel and expensive medicines and health technologies become available; and demand for better health is increasing as people’s income grows. To meet these needs, countries are in a constant race to secure sufficient and sustainable financing for the health sector. But the gap between the financial needs of health systems and actual spending continues to widen. Even the wealthiest nations struggle to keep up with ever-increasing costs of health services. In the meantime, Sustainable Development Goals put significant pressure on governments to maintain and scale up health services. Health systems are bursting at the seams; and the low and middle-income countries are hit the hardest. Everyone agrees the health of the people is important, although not everyone knows where to find sufficient resources to pay for it. Money can buy health only if it is spent equitably and efficiently. 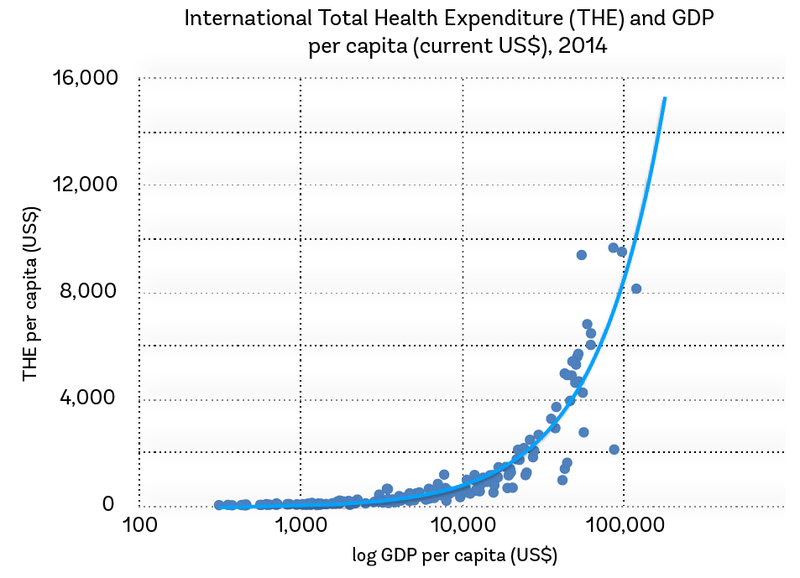 Countries that demonstrate economic growth tend to spend more on health. In countries with medium and high levels of economic growth, growth in healthcare spending can stimulate the economy. In many countries, health spending grew faster than the economy. A recent economic slowdown suggests that countries cannot be complacent and rely solely on existing financial capacity to maintain and scale up health services. Countries develop and graduate from one income status to another. When low-income countries develop into middle income countries, the level of official development assistance they receive suddenly plummets, exposing them to risks of institutional and financial instability. This process is called a “health financing transition”. Countries differ in the way they transition; and in the pace of their investment in health. Those that lag behind economically-similar countries do so for several reasons. They may lack the capacity to raise funds. They may not think of health as a priority investment. Lastly, some countries continue to rely on donors and fail to maximise financing for the health sector by leveraging the private sector. Achieving Universal Health Coverage by 2030 requires countries to raise funds to provide health services; reduce inequalities in the ability to pay; and ensure financial protection against impoverishment due to spending on health. It all starts with generating enough domestic revenue that can be pooled in an insurance fund to buy services that people need. When this pooling is weak, people have to pay for healthcare out of their own pocket. The Lancet Commission on Investing in Health estimated that an additional $70-$90 billion is needed annually to make basic services universally available, which corresponds to a third of low and lower-middle income countries’ total health spending. Getting resources in place is the first step in a chain of decisions: what health services to purchase, from whom, and how to pay. Countries raise and spend money on health when they are committed to doing so. Political will and desire define whether health wins over military or other expenses. Aspiration to raise funds for health does not mean it is immediately possible. Low and lower-middle income countries use between 63% and 78% of their potential to raise revenue. Not long ago, India, Indonesia, and Myanmar allocated less than 6% of government resources to health, less than many African countries. Other countries have enjoyed similar success: Vietnam and Singapore increased their government health spending from 5.6% and 7.4% of government expenditure in 2004 to 14.2% and 14.1% respectively in 2014. Resources for health can be raised by growing government revenues through effective tax collection and combating tax evasion. Rich countries raise more revenue as a share of GDP; and taxes constitute the largest share of their domestic revenue. Poorer countries have weaker tax collection systems. In around half of low and low-middle income countries, tax represents less than 15% of their GDP. Several countries – Burkina Faso, Kenya, and Senegal – have fully exploited their capacity for collecting taxes, and any extra efforts in this area are unlikely to result in additional financing for health. Taxes can also be earmarked for health. For example, Djibouti and Guatemala direct the revenue from tobacco taxes to health. Economists argue if earmarking tax revenue for health actually leads to increased health budgets – governments may simply reduce health funding from their other sources of revenue. Tax avoidance strategies – such as base erosion and profit shifting – tax incentives to companies, and corruption also undermine the capacity of developing countries to collect tax revenues. The evidence that tax exemptions and credits result in larger foreign investments is scarce. In fact, aside from special cases, tax incentives cause a loss of revenue. The IMF recommends setting revenue targets and broadening the tax base. While income and value-added taxes constitute major sources of income in the developed world, the grey economy of developing countries results in missed opportunities for revenue collection. Lastly, the experience of the Philippines between 2012 and 2016 is one of the most compelling examples of ambitious national tobacco tax reform. It involved a fundamental restructuring of the country’s tobacco excise tax structure and substantial tax increases. This funded an increase in the number of families enrolled in a health insurance scheme, from 5.2 million primary members in 2012 to 15.3 million in 2015. For some countries, broadening the tax base or increasing the efficiency of tax collection is an impossible immediate task. In this case, borrowing provides countries with an opportunity to “live through” the crisis, while front-loading immediate investment needs. Many countries took advantage of a prolonged period of low global interest rates and access to development financing. 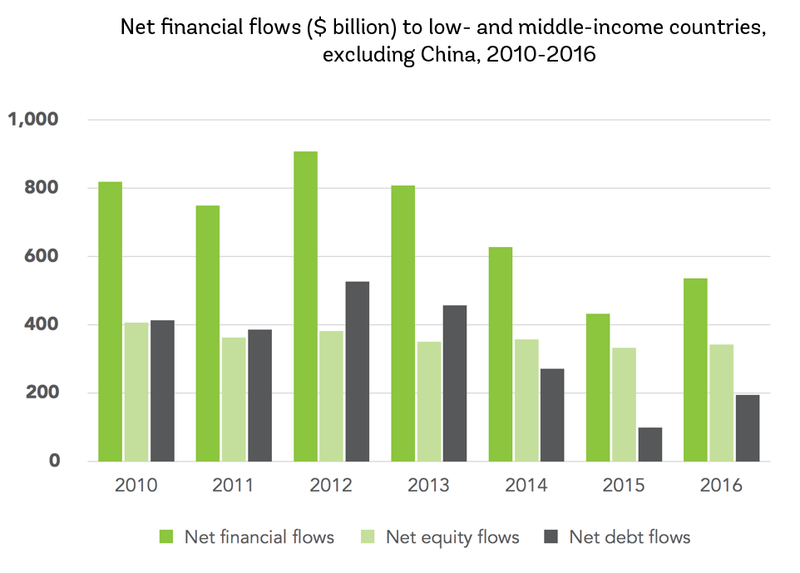 Sovereign debt has continued to grow over the past 20 years, with net debt inflows in low and middle-income countries, excluding China, reaching $194 billion in 2016. Although borrowing provides the funds upfront, many economists are concerned that countries may not have the capacity to repay their debt. 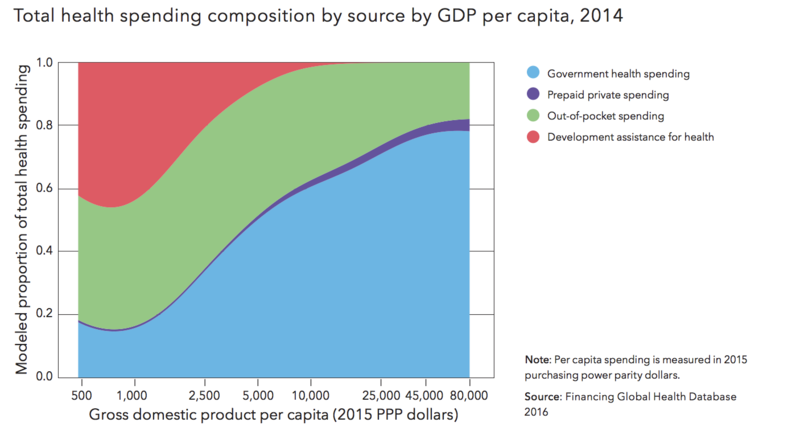 The global health community has put the spotlight on domestic financing for health. Trillions of dollars will be needed to accomplish the SDGs. Projections suggest that even by 2040, only seven of today’s low-income countries will be able to reach the target for sufficient government health spending. The momentum for Universal Health Coverage draws attention to all aspects of health financing reform: from mobilising domestic resources, to ensuring the efficiency of resource use, and equity in coverage of financial protection. The era of a nearsighted approach to development has passed and countries, development organisations, and the private sector should come together in a spirit of unity to look at the health sector and governance from a system perspective. By strengthening co-operation in a fractured world we can overcome global health challenges. The views expressed in this article are those of the author alone and not the World Bank Group.